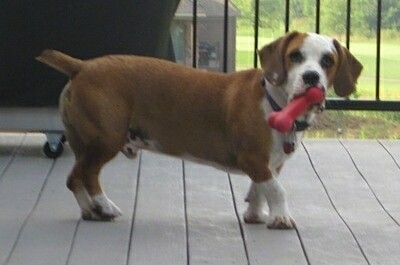 Jackson the Bully Basset (English Bulldog / Basset Hound mix)—"This is our Bully Basset Jackson. He is more affectionately known as “Action Jackson” because that is exactly what he is...full of action. Jackson is extremely loyal and affectionate, but he certainly has a stubborn streak. He loves to play fetch and explore outside. Jackson is quite the head turner. We get so many compliments on how unique he is, and how big his paws are! Jackson thinks every stranger is just a friend he hasn’t met yet. He certainly has a way of communicating exactly what he’s thinking through his facial expressions, and keeps us laughing all day long! We feel so blessed to have a dog that’s so happy and full of life. It is amazing to us just how much a person can love his or her dog! Jackson loves to hide his toys in the corners of rooms, under blankets, and has even gone as far as to bury them under leaves outside. Nothing can separate a Bully Basset from his toys...except food, that is! (1 year, 6 months)"
The Bully Basset is not a purebred dog. It is a cross between the Basset Hound and the Bulldog. The best way to determine the temperament of a mixed breed is to look up all breeds in the cross and know you can get any combination of any of the characteristics found in either breed. Not all of these designer hybrid dogs being bred are 50% purebred to 50% purebred. It is very common for breeders to breed multi-generation crosses. 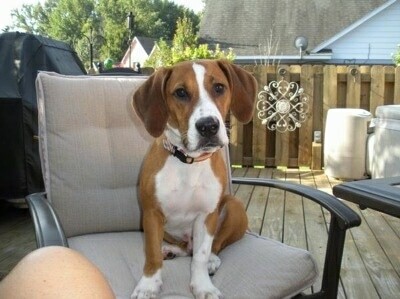 "This is Boomer, my Bulldog / Bassett Hound mix. I could not ask for a better mixed breed; very loving and good with children and other animals." "This is our Norman. 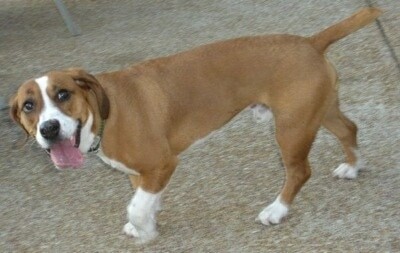 He is part English Bulldog part Basset Hound. He is amazing and very affectionate. 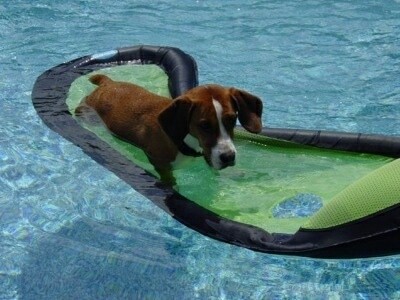 He loves to swim, run and sleep. We get so many compliments how soft and perfectly marked he is. He is very, very spoiled and runs the house. He just turned two and we have loved every minute of it. WE love him, if you can't tell :) "
"This is my dog Louie at 10 weeks old. 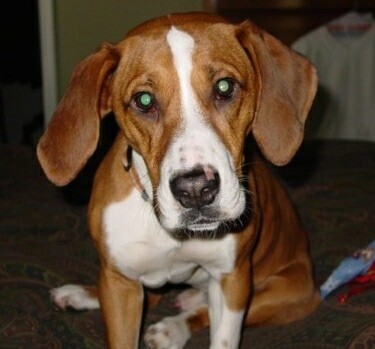 Louie is a Bully / Basset cross. I have all of the documentation that shows that his father was a purebred English Bulldog and his mother was a purebred Basset Hound. The person I bought him from actually referred to his mix as a Bullet (Bulldog / Basset). " 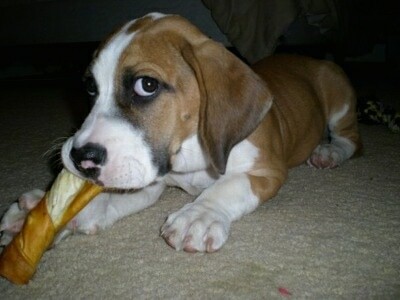 Louie the Bully Basset puppy at 4 1/2 months old chewing his bone. "This is my sweet, sweet Jezzibellarina! She is a Bully Basset! I have had many dogs in my life but she is definitely the most entertaining and sweetest! She is always discovering something new to interest her. She is 6 months old in this picture and had been playing all day. When she is ready to sleep she loves to nuzzle and cuddle. When I awake in the morning she nuzzles under my neck, turns with her belly in the air and gets kisses and massaged. She loves everyone." 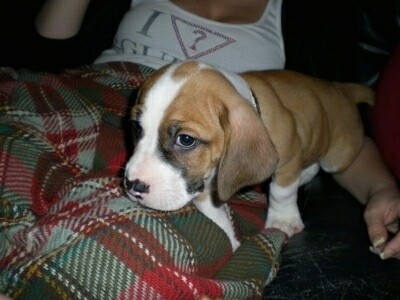 "Here is Waffles, our brand new Bully Basset puppy (English Bulldog and Basset Hound mix). Waffles has long ears like a Basset and is stocky like a Bulldog. He is playful and loving, but does like to chew a bit." Waffles the Bully Basset puppy in a playful mood. 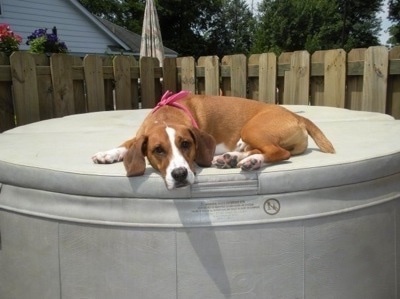 "This is Waffles, my English Bulldog / Basset Hound mix. He is full grown now and just turned 2 years old. Waffles is about 40 lbs. and full of life and energy. He is by far the best dog I have ever owned. He is very quick to learn new things, and seems to pick up on everyday phrases fairly easy. Waffles has days where he can run around for hours, and others where he will do nothing but lie around and sleep. Waffles has never demonstrated any form of aggression toward other dogs, cats, children, or adults. I'm not sure where he got it, but Waffles can jump at least 4 feet high, which is odd, considering the breed mix. I have never had to teach Waffles to not chew on things that weren't his. He just always seems to know right from wrong. Waffles has never had any serious health issues. Although, like Basset Hounds, his ears do require regular cleaning. From the moment I got Waffles, he has been a complete joy and I cannot imagine a life without him. I couldn't dream of a better breed mix." Waffles the Bully Basset full grown at 2 years old sitting on the chair. Jackson the Bully Basset (English Bulldog / Basset Hound mix)—"A genuine Bully Basset picture...worn out after a day at the dog park. Jackson has so much energy, but not very much stamina! (1 year, 8 months)"
Jackson the Bully Basset (English Bulldog / Basset Hound mix)—"Jackson was a mischievous little puppy (aren’t they all? ), but he is growing up to be such a gentleman...not to mention, a very smart guy! He has even learned to open and close his doggy gate all by himself! 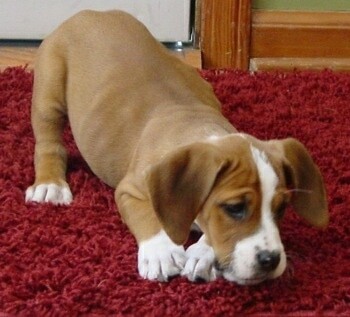 (1 year, 6 months)"
Jackson the Bully Basset (English Bulldog / Basset Hound mix) as a puppy—"Jackson with a belly full of pumpkin seeds at 2 ½ months." 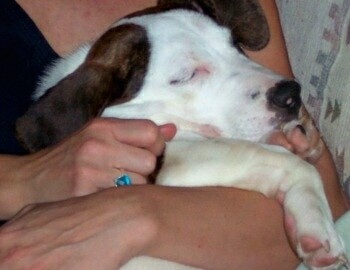 Jackson the Bully Basset (English Bulldog / Basset Hound mix) as a puppy—"A tired little puppy! 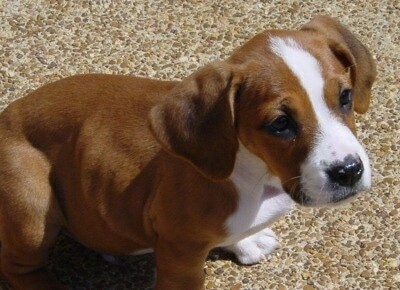 Jackson, our Bully Basset at 2 months."